Neptune is the eighth planet from the Sun and the fourth largest planetary member of the solar system. Its orbit is slightly elliptical and lies beyond that of Uranus. Neptune has a mean distance from the Sun of about 4500 million kilometres, placing it about 30.1 times further from the Sun than is Earth. Neptune is so far away that when Voyager 2 was passing the planet the radio signals from the probe took over four hours to reach Earth. Neptune travels around the Sun once every 165 years and rotates with a period of 16 hours 7 minutes. In its equatorial zone, winds blow westward at close to 1500 km/h, creating huge storms. Figure 12.4 Orbital path of Neptune (distance circles are in astronomical units, AU). Neptune spins on an axis at an angle of 29° from the vertical. 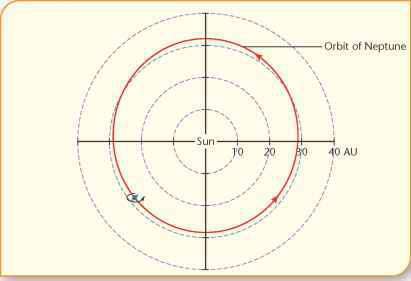 This amount of axial tilt is similar to that of Earth. 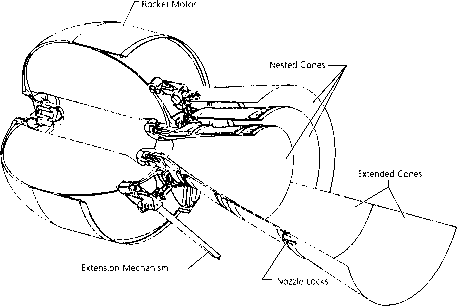 Because of this angle, it was expected that Neptune's poles would be colder than its equator. However, astronomers using Europe's Very Large Telescope in Chile found that the planet's south pole is about 10°C warmer than elsewhere. This imbalance in temperature probably explains why Neptune has such strong winds. Neptune is a gaseous planet with a mass about 17 times that of Earth, but it is not as dense as Earth. The average density of Neptune is about 1.64 g/ cm3, compared to Earth's density of 5.52 g/cm3. This is mainly due to the different compositions of the two planets. Neptune's composition and interior are similar to those of Uranus. Both planets have a rocky core surrounded by frozen ammonia, methane and water. Hydrogen contributes only about 15 per cent of the planet's total mass. Compared to Jupiter and Saturn, Neptune has more ammonia, methane and water.